The student practices basic self- advocacy skills by identifying when he/she needs help and asks for assistance appropriately as he/she completes a puzzle that is missing a piece. 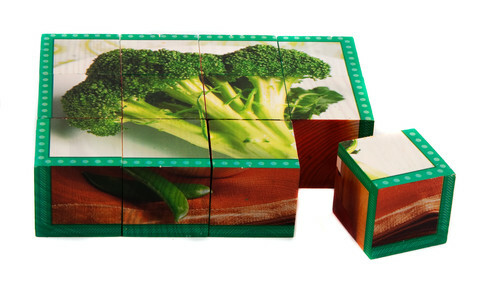 Stages Learning Materials Real Life Learning Vegetable Cube Puzzle. This lesson is written as a 1:1 activity for a student and teacher or therapist. 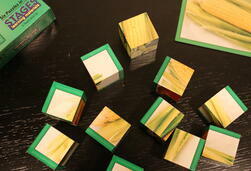 Before the lesson begins, remove one of the puzzle pieces and put it in your desk drawer, or another hiding place. Start the lesson by reviewing why people to talk to each other. A specific conversation about various scenarios in which people ask for help may also be useful. Reasons people talk to each other might include to be social, to get or give information, or to ask for help. People ask for help for many reasons, examples include needing help to safely get something out of the over, having a taller friend reach a high shelf, or letting someone know if a task is frustrating. It is important to give examples that the student can relate to, such as actual experiences they have had. After giving a few examples of your own, see what the student can come up with! Tell the student that they will be putting together a puzzle today and that these puzzles can be tricky. Make it clear that you expect them to ask you for help when/if they need it. Modeling the correct language and/or writing down appropriate phrases for students to refer to throughout the lesson may be useful. Role play with the student ways in which they can appropriately ask for help so that they have an idea of what you want them to say as they are solving the puzzle. If the student is nonverbal, teach them how to get your attention, such as by raising their hand, and then using a picture, pointing to a phrase, or using a gesture to indicate that they need help. Students using AAC communication devices can be shown the location of appropriate words/phrases in their device in order to ask for help. Let the student pick which picture they would like to put together (for the Vegetables puzzle they can choose bell peppers, broccoli, carrots, corn, cucumber, and peas. 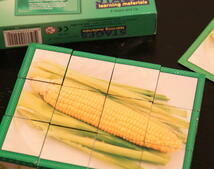 In this example, the student chose corn.) The student can keep the solution guide card to use as a reference throughout the puzzle-solving process. The colored borders around the edges of the puzzle have different patterns on them. Looking at the solution card to determine which pattern goes around the border of their chosen image will give the student a place to start. They can begin by making sure their puzzle pieces all have the same border pattern as the solution card. The 2 middle pieces of the puzzle do not have a patterned border. The student needs to identify which side of the cube to use for these pieces by looking for recognizable parts of the vegetable they are putting together. 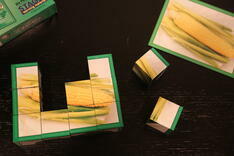 (For example, a student putting together the corn puzzle should recognize that the correct middle pieces will not be red or orange like the bell peppers. Some students may need more help with this than others.) The solution card can be a great reference for this task. For some students, it may be helpful to put the appropriate solution card in the bottom of the original Stages Learning Materials box that the puzzle came in. You can also put the cardboard divider in the box, showing the student an estimate of what the face of each piece will look like. 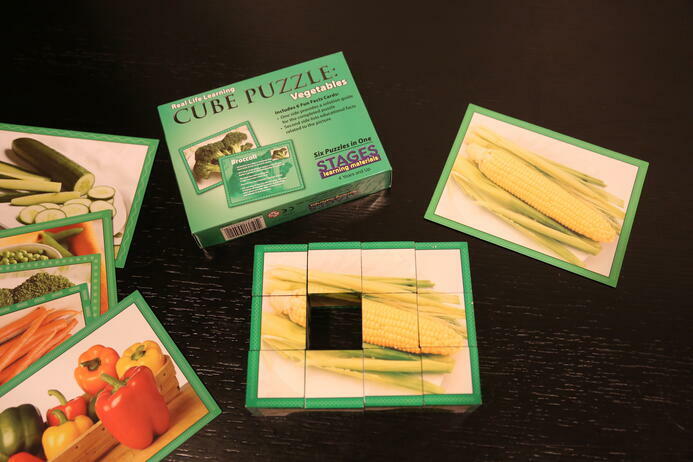 As they begin to work on the puzzle, they may ask for help with various parts of the process, from making sure each side of the puzzle shows a part of the corn (or other vegetable) picture, to lining up the edge pieces. If the student appropriately asks for help, assist them with only what they ask for. If they do not ask for help, or become visibly frustrated, remind them that you are there to help, but only if they tell you what they need. It is important that the teacher does not over-help in this lesson or provide assistance which the student has not asked for. When adults intervene in this manner, students do not have the chance to realize for themselves what it is they need help with, let alone determine how to go about getting the help they need to solve the given problem. Stepping back and letting the student struggle can be difficult for teachers. Be aware that for many students with autism and other special needs, the challenge of physically putting the puzzle together may be equal or greater to the challenge of appropriately asking for help with what they need. A student may identify that they need help matching up edge pieces, but if they do not know the word edge or cannot think of another way to tell you what they mean, they will likely become frustrated. A teacher may assume it is because they do not know what to do next, when in fact the student is well aware of what needs to be done, they just don’t know how to ask for help to make that step happen. If a student asks for help in a generic way, such as, “Can you please help me?” encourage them to be more specific in their request, either by using their words or by showing you what they are trying to do. At some point the student will realize a piece is missing. They should appropriately let you know that they cannot complete the puzzle without the missing piece. It does not matter when this happens. Some students will immediately identify that they only have 11 pieces when they should have 12. Other students may not realize they are missing a piece until all the other pieces are in place. The importance of this step is that the student asks for help to find the missing piece. When the student tells you the piece is missing, let them know you can think of a few places it might be. Ask if they would like your help in finding the missing piece. The student should agree they would like your help. After a brief search, “find” the missing piece in the spot in which you hid it before the lesson began. If the student does not seem to care if they find the piece, suggest that they help you to find it. Many students enjoy being the teacher’s helper. Students also often enjoy seeing that a teacher has made a mistake. If necessary, make a show of being disorganized or forgetful about where you could have possibly put that missing puzzle piece. When the puzzle is done, praise the student for asking for help, reminding them that they would not have been able to finish the puzzle without telling you a piece was missing. For some students, this may be the only help they needed with the puzzle, while others may have needed assistance every step of the way. The key here is to praise the student for communicating their need to someone else, in this case, telling the teacher they could not complete their task because (at the very least) they were missing a piece of the puzzle.